I recently started playing Battlefield 3 and remembered that I have a Fraps license so I installed it and started recording some stuff. Unsurprisingly the performance made a big dip when I recorded. A glance at my PC told me the harddrive was at fault, probably bringing the whole system down due to IO. Since my PC has more than enough RAM I decided to set up a 5Gb Ramdisk to see if that helped. It did, when writing the video files to the ramdisk I hardly had any performance hit. Unfortunately 5GB isn’t going to last long while recording 1920×1080 @ 40FPS (a few minutes footage at most). "$srcfile in use, cannot be copied right now"
The last little problem I noticed is that the 5GB ramdrive wasn’t big enough (Fraps seems to create some dummy files and fills them up). Forcing Fraps to make smaller files by toggeling the recording fixed that though -> pressing F9 twice fast will drop a few frames though. 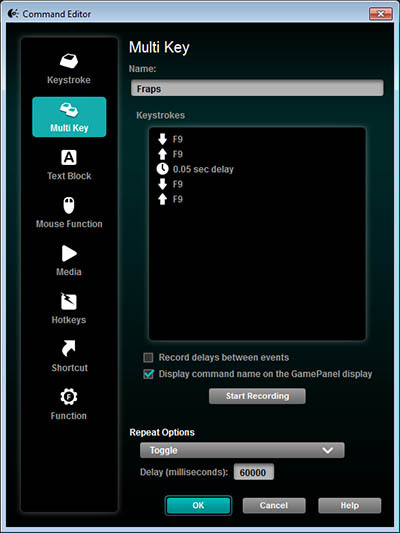 I used my Logitech G13 for that, just had a key mapped to press F9 quickly every 60 seconds. The shortest gap I could get working reliably is 50ms. This all probably sounds awfully complicated, but it works and solves my problem. Fraps is great software, but it would be immensly helpful if you could set the file size in the settings (instead of it defaulting to 4GB). Or, even better, if Fraps could rework their IO system to work more efficiently.